Willie Fritz met with the media on Monday as SHSU announced on Friday that he would replace Todd Whitten as the Bearkat football head coach. Willie Fritz, who has produced an overall record of 220 victories and 66 losses in a 28-year career as both a head coach and an assistant, will become the 14th head football coach at Sam Houston State University. Bobby Williams, Sam Houston director of athletics, officially welcomed Fritz as the Bearkat football head coach during a press conference on Monday (Dec. 21) morning. "I can’t tell you how pleased I am personally to have Coach Fritz here," said university President Jim Gaertner. "He’s been successful everywhere he’s been. He knows Sam Houston, he went over to Blinn and won two consecutive national championships over there, went up to Missouri and just really turned the program around. I’ve been told that when he was here coaching our special teams is when we started blocking kicks. "I know he can coach, and he fits in well. I’m sure he’s the person for the job," Gaertner said. "We have big hopes and aspirations and I know he will succeed." Fritz answered questions from the media on recruiting and game attendance, as well as discussed some of his goals as the head football coach. "We can’t lose sight of the fact that the No. 1 goal for all of our student athletes is to get their degree. If they play for me for four or five years and they leave here without a degree, I really think they wasted their time," Fritz said. "No. 2, I want guys who have a passion for football like I have a passion for football. I want guys who are interested in getting stronger and quicker and faster and being the best football player they can be but never losing sight that they want to be on a championship team. "Next, I want to make sure I lead guys in the right direction. I want to make sure that our guys leave here as a better person than when they came in. If you’re around me for four or five years, I hope I’m a better person in that time period as well," he said. "And last but not least, we want to do all of these things in the right way. I know coaches come up and make guarantees all the time. I’ve been a part of two turnarounds as far as football programs are concerned, first at Blinn junior college—they hadn’t had very much success prior to our arrival—the same thing at the University of Central Missouri. The one thing I can guarantee, we’re going to roll our sleeves up and we’re going to work extremely hard. No one is going to out-work us in the Southland Conference." 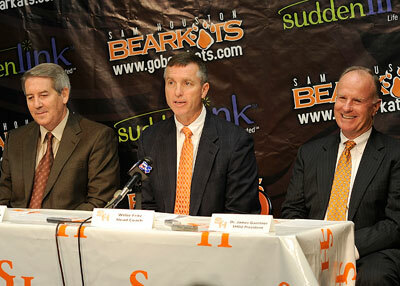 "I am honored to be the new head football coach here at Sam Houston State University," Fritz said. "When I was a graduate assistant back in 1984 and I was strolling the sidelines at Pritchett Field, one of my dreams was to be the head football coach here at Sam Houston." Williams announced the decision to hire Fritz on Dec. 18. "Willie Fritz has coached championship teams at Central Missouri, Blinn, Coffeyville and Sam Houston," Williams said. "He is a proven motivator and recruiter. What impresses me most about his career is his success as a defensive and special teams coach. I've seen Willie on the sideline, in the locker room, breaking down film and on the recruiting trail and know first-hand of his work ethic, enthusiasm, integrity and ability." The "winningest" coach in the University of Central Missouri's 113-year football history, Fritz rolled up a 97-47 record in 13 seasons as Mules head coach. In 11 of those seasons, Central Missouri has posted winning records. He is the only Central Missouri head coach to produce eight consecutive seasons of seven or more wins. "Willie Fritz has a proven track record as someone who can come in and turn a program around," Williams said. "With 16 years experience as a head coach and 12 as an assistant he has been successful everywhere he has worked. He recruits quality student-athletes who are motivated to excel both on the field and academically." From 1993 to 1996, Fritz was head coach at Blinn College where he turned around a program that had gone 5-24-1 in its three previous seasons. In just a short time, he produced a 39-5-1 record and two national junior college championships. For his efforts at Blinn, Fritz has been inducted into the NJCAA Hall of Fame. In his 13 years at UCM, the Mules enjoyed an 84 percent graduation rate with three Academic All-Americans, 14 Academic All-Region and 144 MIAA Commissioner's Academic Honor Roll selections. Central Missouri ranked No. 11 in NCAA Division II football attendance. "Many thanks go out to several members of our Sam Houston community including university officials, athletic staff and coaches and friends of the program who participated in the interview process," Williams said. "After hosting an outstanding group of six candidates who visited the campus, we received overwhelming support for Coach Fritz from everyone who was involved in the process." Fritz played college football at Pittsburg State University where he was a four-year starter as a defensive back and played on two conference championship teams. He was a student assistant coach for the Gorillas in 1982. Fritz served as an assistant football coach at Shawnee Mission Northwest High School in Kansas in 1983 and at Willis High School in Texas in 1986 and was defensive coordinator at Coffeyville Community College in Kansas from 1987 to 1990. Fritz and his wife Susan have three children, Wesley (19), Elaine (17) and Brooke (12).